Car hire gets the thumbs up from motorhomers! Hiring a car is a popular option for many motorhomers – offering that extra bit of flexibility when on their motorhome holidays. Some campsites even offer electric car hire by the hour – perfect for a quick trip to that supermarket with the restrictive height barrier! In our latest community poll, two thirds of voters said they would hire either some kind of car to explore the local area – particularly for those places where a large motorhome can’t reach, due to height restrictions, for example. 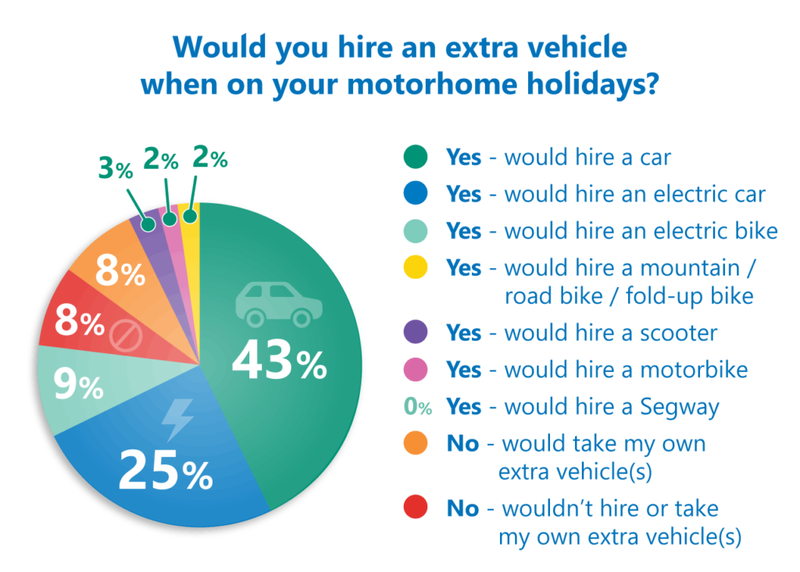 When we asked motorhome owners if they would hire an extra vehicle when on their holidays, 68 per cent of voters said they would hire a car, with 43 per cent opting for a standard car and 25 per cent saying they would hire an electric car, if on offer. The next popular extra vehicle was an electric bike with nine per cent of the votes, and just a handful of voters said they would hire a mountain or road bike or a motorbike. Rather than hiring an extra vehicle, eight per cent of voters told us they would take their own. Only eight per cent of voters said they wouldn’t hire or even take their own extra vehicle, choosing to use their motorhome to explore, walk or public transport. This is much easier if you have a small, compact vehicle. Graham Casey said he would usually just use his motorhome but recently got two electric bikes and a trailer for the dog. “However might hire a small car if I really wanted to go a distance,” he added. Geoffrey Houghton often takes their bikes on their motorhome holidays. Christine Collins said the possibility of hiring a small electric car by the hour was very attractive and Ian Grimbleby said he’d already signed up for car hire! Feel free to leave your comments in the box below and look out for our new poll on our news home page. I have tried to arrange car hire whilst away in our motorhome but found it very difficult on account of hire firms being reticent about delivery/collection of the hire car to and from our Site. Thwe worry of electric charging points makes me hesitate!! Surprised electric cars didn’t get more of a vote. Maybe still some apprehension about electric over conventional?